The kids are back to school and you’re back from summer vacations. 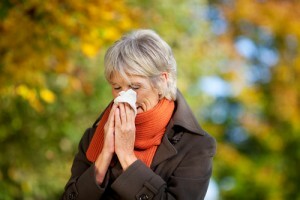 It’s a season for change… Unfortunately, it often comes with sniffles and sneezes. That being said, it is important to know the difference between hay fever vs sinus infections. About 30 million people across America suffer from pollen allergies known as hay fever, or allergic rhinitis. Ragweed pollen kicks into high gear in autumn, which means symptoms can run wild. The trouble? Hay fever symptoms often get misdiagnosed as a sinus infection. This leads to overmedication and lingering discomfort because the two health hassles are very different. Hay fever often means itchy, watery eyes. The same isn’t true with sinus infections. Hay fever sufferers often have clear nasal discharge, while people with sinus infections often have a fever and yellow or green nasal discharge. Firstly, it’s important to check with your doctor to find the best treatment plan for you. Every one’s symptoms are unique and will require different treatment. For example, your allergies could be treated with antihistamines, decongestants, nasal sprays or allergy shots. On the other hand, sinus infections may not need medication (for shorter episodes), or may be treated with pain relievers, decongestants, nasal sprays or antibiotics. Not sure what’s making you sneeze and feel congested? 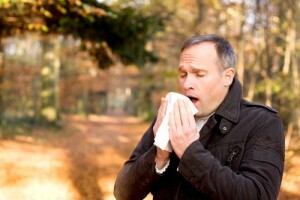 Don’t let allergies or sinus infections ruin your fall. Schedule a consultation, and we’ll help with a treatment plan that’s right for you.